Qatar Airways has announced that it will fly internationally-renowned Bollywood actress Aishwarya Rai Bachchan to Doha to provide a glittering opening to this year’s Qatar Show 2019, featuring some of the world’s finest gemstones, jewellery collections and watches. Bollywood celebrity and global fashion icon Aishwarya Rai Bachchan took the centre stage at the Fashion Weekend International (FWI) 2018 in Doha Friday, showcasing the latest collection of acclaimed fashion designer and Oscar jury member Manish Malhotra. 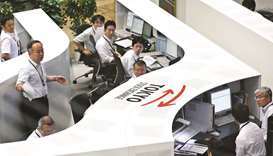 Asian markets yesterday built on last week’s gains following another record close on Wall Street, while the euro edged up on news that French President Emmanuel Macron’s party had secured a healthy majority in National Assembly elections.